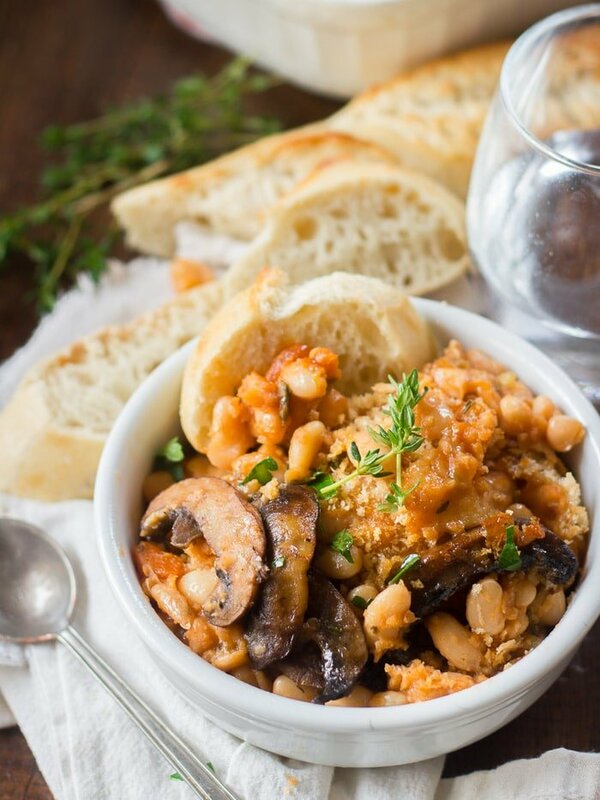 This vegan cassoulet is made with a savory slow cooked stew of garlicky white beans and smoky portobello mushrooms, sprinkled with panko breadcrumbs and baked to bubbly perfection. Most traditional casseroles are made with cheese, which is kind of a bummer if you don’t eat cheese. It’s also tough to veganize cheesy casseroles if you don’t use store bought vegan cheese, which I generally don’t. Cassoulet is an exception. No cheese! This is pretty exciting, especially when you consider that it’s also French, because French food can be pretty cheese-heavy. 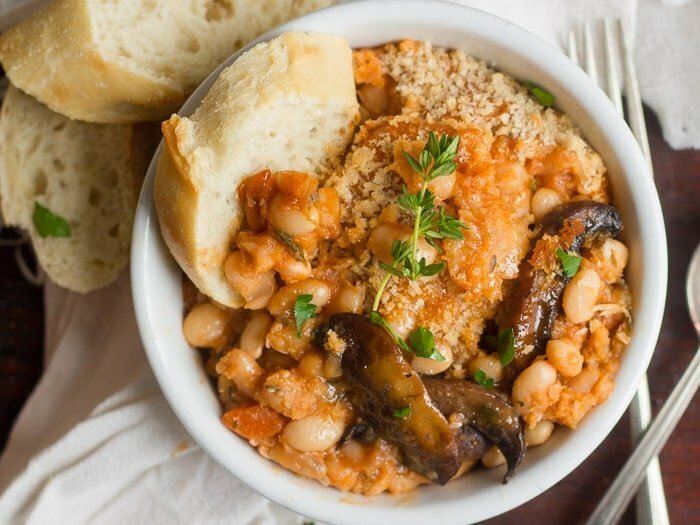 What traditional cassoulet does have is gobs and gobs of super slow cooked garlicky white beans and herbs, all topped with a crispy breadcrumb crust. 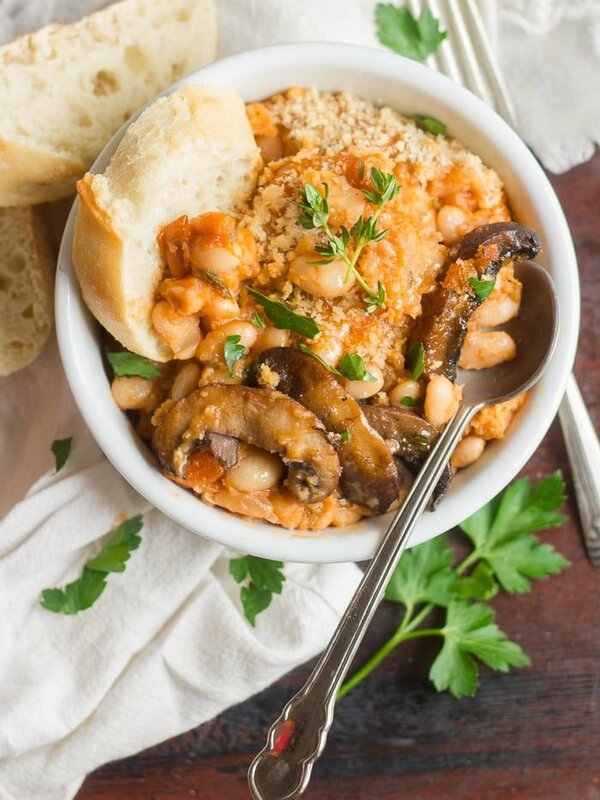 So it kind of makes sense that vegan cassoulet would work out well when you think about it: white beans cook up super creamy and luscious, so who needs cheese? The other thing traditional cassoulet has is meat. Lots of it. I perused a number of cassoulet recipes, and even though there are lots of variations on the dish, they generally seem to involve multiple types of meat and animal fat, and all kinds of involved ways of cooking the meat in the animal fat. So it can be a pretty complicated dish. The great thing about making a vegan cassoulet it is that you can just throw all that stuff out the window, and the recipe ends up being a lot simpler. In place of all the eight hundred varieties of meat one might include in a dish like this, I went with just substitution: smoky sautéed portobello mushrooms. They were everything I needed, and so delicious. I’m not going to kid you and say this dish is quick and easy…but it is at least relatively easy. Most of the long cook time is hands off — simmering stew on the stove or baking up the casserole in the oven. I did go the extra mile and make this from dried beans, as opposed to canned, which means soaking, and that’s something I’m normally too lazy to do. I feel like canned beans would get mushy with the long cook time. Also, if you want to make this during the week (and Valentine’s day is on a Tuesday this year, so you should! ), just cook the stew in advance. Stick it in the fridge for up to two days. The day of serving, just transfer it to the baking dish, sprinkle with breadcrumbs, and bake away. Coat the bottom of a large pot with 2 tablespoons of olive oil and place over medium heat. When the oil is hot, add the shallots, garlic, carrots, and celery. Sauté for about 10 minutes, until the veggies are tender. Add the white wine and bring to a simmer. Allow to simmer for about 5 minutes, until the wine has reduced by about half. Add the beans, broth, tomato paste, bay leaves, parsley, thyme, and cloves to the pot. Raise heat to high and bring to a boil. Lower heat and allow to simmer, uncovered, until the beans are tender and most of the liquid has been absorbed or cooked off, about 1 1/2 hours. You want it to have the consistency of a stew — not too dry, but also not a soup. Remove from heat, discard the bay leaves, and season with salt and pepper to taste. When the stew is almost finished cooking, preheat the oven to 325°. Coat the bottom of a large skillet with the remaining 4 tablespoons of olive oil and place it over medium heat. Once the oil is hot, add the mushrooms an an even layer. Allow to cook until the mushrooms are browned on the bottoms, about 5 minutes. Flip and cook 5 minutes more. Once the mushrooms are browned on both sides, sprinkle with the liquid smoke and quickly flip a few times to coat the mushrooms. Remove from heat. In a small bowl, stir the panko breadcrumbs together with 1/4 teaspoon each of salt and pepper. Fold the mushrooms into the stew, then transfer everything into a large casserole dish. Sprinkle the top with the panko mixture. Cover the dish with foil, and bake until the casserole is bubbly and the breadcrumbs are lightly browned, about 1 hour. Divide into bowls and serve with crusty bread. I used a 2 quart casserole dish for this, and while everything fit, it was a tight squeeze, so use something a tad larger if you've got it. 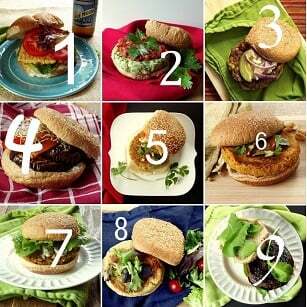 ❤❤❤ all your recipes. Will try this one this weekend. Wanted to mention that you listed the broth twice. No big deal but thought you would want to know. You’re welcome ?Made the whiskey lentil Sheppard pie for tonight. Oops! It’s 325°. Thanks for catching that! Looks absolutely delicious! I’ll have to give this a try very soon. Thanks Celeste! I hope you enjoy it! Am I cooking the mushrooms in a skillet over medium-heat on the range? Or am I cooking in a skillet in the oven at 325? I’m a little confused by the wording here. The mushrooms get cooked in the skillet on the stove – you’re just preheating the oven in prep for the step after that. I just bumped the mushroom instruction to the next step to make it a bit more clear. I hope that helps! Thanks Kathryn! I hope you enjoy it! Can I do this with canned beans instead? How many cans would I need to equal a pound? About 3 1/2 (14 ounce) cans is equal to a pound of dried beans. You’ll need to make a few adjustments, reduce the amount of liquid, etc. I haven’t tried this with canned so I can’t give exact instructions though. I’d love to hear how it works out if you try it! Glad you enjoyed it! Thanks Geoffrey! I am having a dinner party for 20vegans and love this recipe? How many servings are in this recipe? This is amazing! 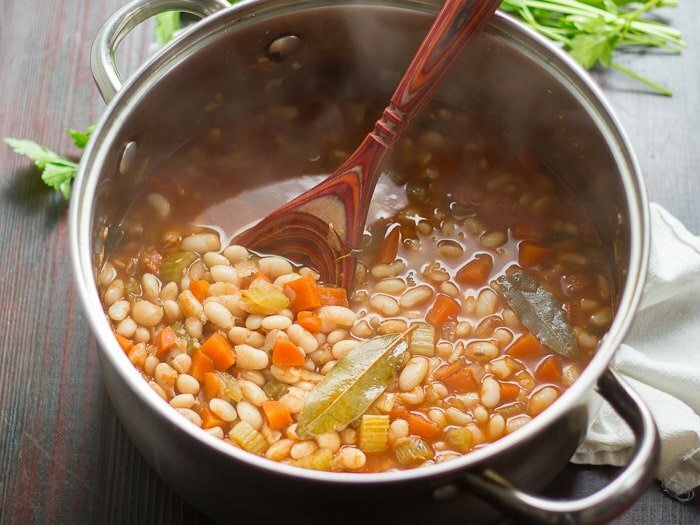 I’m sharing this recipe with my bean group! Thank you! The smoked mushrooms were perfect! I made this on a rainy kinda chilly finally fall-ish day and it was perfect! I doubled the recipe and squeezed it into a 6 qt Dutch oven. I used 2 lbs of mushrooms since that was easiest and who doesn’t love mushrooms. This will definitely be a regular winter meal. This was delicious! I made the beans in the slow cooker (low for 6hrs) and prepped ingredients in the morning. That made everything much easier that night. Just sautéed shallots and veggies, combined everything and cleaned up while it baked. I’m so glad it worked out and you enjoyed it! Thanks so much Sarah! Hello! Do you think this recipe is OK to make ahead? I was thinking of preparing it this afternoon and placing it in the fridge so it’s ready to go when I get home from work the next day. What are your thoughts? Yup! We actually really enjoy this as leftovers in my house. :) I just zap them in the microwave, but I think it would also be fine to pop it back into the oven for a few minutes. I’m afraid I don’t have an instant pot yet, so I’m not sure! Loved this recipe!! I added nutritional yeast to the bread crumbs and as a topper. My non-vegan boyfriend gobbled it up too. Thanks for sharing! Hi Alissa! I have to make some savory pies for our office pi day celebration this Thursday (3.14) – yes, we are educators and love math – lol! I’m making omdovidual beef bourguignon meat pies as well as individual vegan pies. I’m hoping to turn your cassoulet into a vegan savory pie by filling several ramekins and covering them with puffed pastry. I’m trying to figure out if I still need to add the Panko to the cassoulet prior to baking it in the oven with the puffed pastry topper. Any thoughts?